I promise, this is my last post about the closet. I just wanted to talk about a few of the details and then I'm on to the next project! First of all, let's talk about whitewashing. I took the creamy white paint in a flat finish and brushed it onto the cedar planks. I did not use a roller on any part of this space, opting for just a regular 4 inch paintbrush. Let me tell you, those planks absorbed the paint immediately. I was amazed! I had to work quickly to get any sort of whitewashed effect. I went one plank at a time so that I wouldn't have a random, streaky finish. As soon as I painted a plank, I took a damp rag and wiped some of the paint off. Hence, whitewashing. I'm pretty sure this is not how a professional would tell you to go about this, but I'm not claiming to know what I'm doing. Overall this technique was easy, but it was a little time consuming and tedious. Whitewashing lends itself well to imperfections, since it is supposed to look charming and aged. I like any paint finish in which I can pass off an 'oopsy' as added charm, that's for sure. Had I decided to paint the walls solid white, it would have taken at least two or three coats. In the end, I think whitewashing was faster. I think we can all agree that it really brightened up that cedar dungeon, right? The drawers didn't have any knobs on them before, and they were a little difficult to pull out. 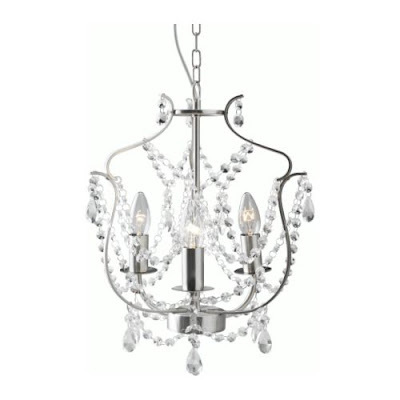 I got the crystal knobs at Hobby Lobby to tie into the chandelier. They seem so small, but they make a big difference in pulling it all together. Details, details! I bought this oversized bath mat from Ikea because A) it's super soft on your feet, B) it's white and simple and C) it's cheap– $9.99! The clothes and shoes are all back in the closet, and everything is back in working order. Alright, that's it for the closet! On to my next project, which is a nursery makeover at our church. I'm off to buy the paint today to start my mural, and I can't wait to share it with you. It's a big undertaking so I'm not really sure when we'll be finished, but I'll keep you posted!